Type 2 diabetes is a common and increasingly prevalent disease that accounts for about 90% to 95% of all diagnosed cases of diabetes. 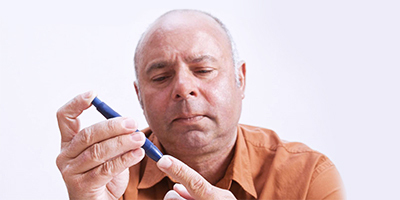 Unlike people with type 1 diabetes, the bodies of people with type 2 diabetes produces insulin, but produces less or the body cannot use the insulin well. This is called as insulin resistance as the cells in the body become resistant to the normal levels of insulin. Hence, type 2 diabetes develops when the body resists the effects of insulin or when the pancreas does not produce enough insulin to maintain the blood glucose levels in a normal range. When glucose builds-up in the blood instead of going into the cells, the cells will not function properly as they are starved for energy. Eventually, high glucose levels may hurt your eyes, heart, kidneys or nerves. This type of diabetes generally occurs in adulthood after the ages of 30 to 40 years, but can also occur in younger people. Type 2 diabetes results from a combination of environmental and genetic factors. However, there is greater genetic predisposition when associated with lifestyle factors like obesity, insufficient physical activity, poor diet and high blood pressure. The first line of treatment lies in improving your diet and lifestyle. If the blood sugar level remains high in spite of making lifestyle changes, such as incorporating a healthy meal plan and moderate physical activity, then tablets to reduce blood glucose levels are prescribed. Insulin injections are advised if the glucose levels remain high despite taking tablets. Certain classes of diabetic drugs are linked to pancreatitis, pancreatic cancer and thyroid problems. Another class of drugs called thiazolidinediones may cause balder cancer or heart problems. Since type 2 diabetes is associated with modifiable lifestyle risk factors, it is possible that doctors will recommend a treatment based on a more regulated diet and a stepped-up exercise plan instead of medications. The secret of managing type 2 diabetes does not come as a magic potion. Simple lifestyle modifications can go a long way in keeping your blood glucose levels close to normal and preventing both short-term and long-term complications. Change your lifestyle today to improve how you feel today and help ensure a healthier tomorrow.